WASHINGTON (Oct. 30, 2015) -- The Army's Training and Doctrine Command, or TRADOC, has stood up its own online app store to bring the command's body of knowledge to Soldiers where they are most likely to ingest it: online and on the move. "Most Soldiers have a mobile device of some sort: a cell phone, a tablet, or something," said Lt. Col. Joseph A. Harris Jr., TRADOC capability manager for mobile learning, or TCM-M. 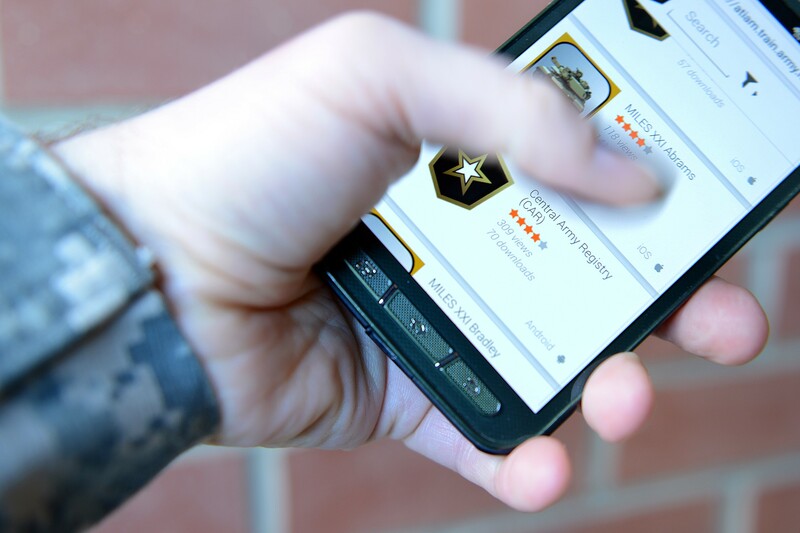 The Army's Training and Doctrine Command has stood up its own online app store to bring the command's body of knowledge to Soldiers where they are most likely to ingest it: online and on the move. "They are using those devices every day to get the information they need. And usually, that's through a mobile app of some sort. What we are trying to do is ensure that we use what they are using already in order to get the information to them. We have a digital Army, and Soldiers have that digital mindset - and we are just capitalizing on that," Harris said. One of the things the newly-created TCM-M did was to create the "TRADOC Application Gateway," or "TAG," which will host unclassified, non-"for official use only" apps and interactive digital publications. To access the app store, Soldiers can point their mobile devices to www.adtdl.army.mil, and log in to the site with just their Army Knowledge Online login name and password. Soldiers can, but don't need to, use a common access card to access the site. Right now the TAG hosts only a tiny handful of the TRADOC-produced apps that are available elsewhere in commercial app stores, Harris said. Titles on an Android app store, for instance, include "DFAS Info2Go," "GoArmyEd," "Performance Triad," and "Army Comprehensive Doctrine." There are many others on other commercial app stores. Matthew MacLaughlin Jr., TCM-M's senior mobile instructional design specialist, said that the few apps up now on the TAG are part of the evaluation for the site. By January, he said, they expect to make available on the TAG from 100 to 150 apps that support three mobile platforms. For development of new applications to meet the needs of Army organizations, MacLaughlin said he's got a team of six developers at TCM-M that can do in-house development for Android, iPhone and Windows Phone. "Anybody can request an app," he said, or they can develop their own app. "We want to empower them and give them guidance on how to build their mobile applications correctly." In the future, MacLaughlin said, he sees teams of developers going to locations throughout the Army to train mobile app developers on-site. In that way, a proponent Army organization can learn to develop its own apps to support their own mission. "They won't have to go through us to create that mobile app. They will create it there, or as much as they can, and that can shorten the development timeline," MacLaughlin said. Before any app can make it to the TAG, it must first pass at least two forms of verification, said Brian Robertson, program integrator, TCM-M.
Apps must be shown to be safe from malicious code, to make sure they don't damage the Army network where they will be hosted or the phones of the Soldiers who will install them, Robertson said. Additionally, he said, proponent organizations for the apps must review the app to ensure that it contains accurate and up-to-date information. Robertson said he expects the TAG will cover mostly learning software, and that the TAG will in the future likely be part of a larger "Army software marketplace" that might also host apps with tactical applications. He said already Army organizations who are independently hosting their own apps are asking that they be transferred to the TAG. Harris said for organizations considering transferring their own apps to the TAG, "they won't lose ownership of their apps. They'll be hosted on the TAG, but they will still own and get the credit for them."